Look, this debate is basic: it’s small government vs. big government. So how cowardly do folks like Blood and Frank Rich have to be that they can’t man up and defend their love for collectivism? The only reason they scream race, is because that debate scares them. They know a racial accusation prevents dialogue, because such a harmful charge far outweighs any benefits of winning an argument. Now, educated people on the right have been saying for a while that our Dear Leader‘s policies are socialist. We now have some verification on this from the extremist left, by way of the Rev. Al Sharpton, who ran for the democrat nomination for President a few years ago. The Rev. Sharpton makes the point that our Dear Leader‘s policies were pretty clearly socialist during the election, so people are just getting what they voted for. You can count on a few things in this world. The swallows will return to Capistrano. Salmon will spawn. Canada’s geese will fly south for the winter. And tax cuts will create growth. 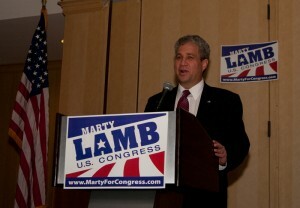 Marty Lamb is a Republican running for the 3rd Congressional seat in Massachusetts. He had his kick off meeting in Westborough, MA on March 26, 2010. There was a very good turnout of supporters. Update: I have some of my photographs from the event posted. Some of the other local bloggers who attended were RightWing Granny and Angel Fleming. Christen Varley of the Greater Boston Tea Party introduced Marty at the event. Update: Marty Lamb has a very different view of the government takeover of the American Health Care system than the incumbent democrat, James McGovern. Based on the long running pulp book series “The Destroyer”, Remo Wiliams: The Adventure Begins is the only screen version of the approximately 150 book series. The cast is actually pretty good, with Joel Grey, Wilford Brimley, Fred Ward and for you Star Trek geeks out there, Kate Mulgrew. Don’t expect high art, but it is fun to watch. “Fear the Boom and Bust” a Hayek vs. Keynes Rap Anthem. Beware the Libertarians mobs! They will take over the government and then leave you alone! Boston Talk Radio host Michael Graham has been following the Tea Party movement since it started picking up speed and now tells you just who those people are. Hint, it’s not the people the leftist talking heads at MSNBC and CNN are describing.